And if you thought the lock was unusual, check out the keys. Roll d12. Bronze master key. Fits 50% of locks on this level or in this part of the dungeon. Darkwood key with long shank. Totally non-conductive for electricity. May be useful for an electrified lock? Fulgurite key of hexagonal shape that reduces electrical damage by 2 points when used to open an electrified lock. Worth 300gp. 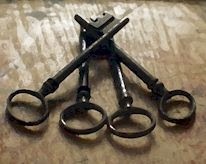 Heavy key of magical red-veined iron that reduces heat or fire damage by 2 points when placed in a lock that radiates heat or flames. Worth 300gp. Jet key set into ring carved from a single piece of stone used by ancient wizards. Warm to the touch, suitable focus for magic jar. Worth 250gp to arcane collectors, 200gp otherwise. Leaden key that reduces negative energy damage by 1 point if inserted into a lock charged with negative energy. Worth 150gp. Naga-bone key of interlocking small bones for the blade and a bone cameo for the bow. Worth 200gp for the craftmanship and exotic material. Plaited red gold and faience key with spiralling blade and bow shaped as a miniature shepherd's crook. The crook is used to disable a needle trap on certain locks by those in the know. Worth 300gp to the right people, 150gp to the uninitiated. Rusted iron key with letters SIR etched on bow. This key radiates moderate transmutation magic. If placed inside a metal lock, and the word 'SIR' is spoken, lock and key collapse into flakes of rust. This destroys and unlocks the particular lock. The key is only usable once. Worth 700gp. Topaz key of rose and orange hue. Enchanted to be tough as steel. Worth 600gp due to craftmanship and enchantment. X-bladed silver key. Fits a specific superior lock that imposes a -20% (-4) to picking due to wards. You're the master of useful and interesting random tables. I love keys anyway. And the d12 seems happy to be rolled after any number of months. Naga-bone key of interlocking small bones for the blade and a bone cameo for the bow.